Godolphin’s smart filly Athiri impressed their Melbourne stable with a solid gallop at Caulfield this morning in the lead up to Saturday’s Group 2 $200,000 Ladbrokes Blue Diamond Prelude (Fillies) (1100m) at that track. Catch Me, above, is the favourite for the 2019 Blue Diamond Prelude for the fillies at Caulfield. Photo by Steve Hart. Trainer James Cummings sent Athiri to his Flemington stables to prepare for the Group 1 $1.5m Ladbrokes Blue Diamond Stakes (1200m) at Caulfield on February 23 and Melbourne foreperson Kate Grimwade couldn’t have been happier how the Lonhro filly handles the Caulfield track. “I thought it was a particularly impressive bit of work,” Grimwade told AAP. Athiri is the winner of her only race start with a two length victory in a 1100m two year old Handicap at Rosehill on December 1 with Glyn Schofield in the saddle but James McDonald will take control of the reins on the weekend. Cummings will get a good chance to evaluate Athiri’s Blue Diamond Stakes credentials when she clashed with the two favourites Catch Me and Brooklyn Hustle in the Prelude on Saturday. The Peter and Paul Snowden trained Catch Me is undefeated from two runs with wins in the Group 3 $160,000 Keeneland Gimcrack Stakes (1000m) at Randwick on September 29 and in the Group 3 $160,000 Ladbrokes Blue Diamond Preview (Fillies) (1000m) at Caulfield on Australia Day. Brooklyn Hustle also created a huge impression with a two lengths debut win for trainer Jason Warren in a 1000m two year old Plate at The Valley on December 1. Betting for the Blue Diamond Stakes at Ladbrokes.com.au has Catch Me as the $4.20 favourite just ahead of Brooklyn Hustle and the Ciaron Maher and David Eustace trained filly Loving Gaby at $5.50 while Athiri is on the fourth line of betting at $9. Early betting for the Blue Diamond Prelude on Saturday has the three fillies in the same order with Catch Me marked as the $2.70 favourite ahead of Brooklyn Hustle at $4 and Athiri at $5.50. Betting for the 2019 Blue Diamond Prelude for the fillies at Ladbrokes.com.au: $2.70 Catch Me, $4 Brooklyn Hustle, $5.50 Athiri, $11 Anaheed, Sizzlefly, $15 Vinicunca, $18 Lankan Star, Lyre, $21 Indiscretion, Movie Role, $31 or better the rest. 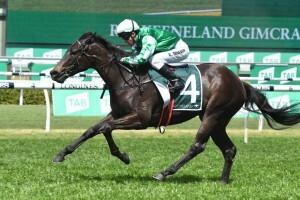 The post Athiri impresses with Caulfield gallop in Blue Diamond Prelude lead up appeared first on HorseRacing.com.au.